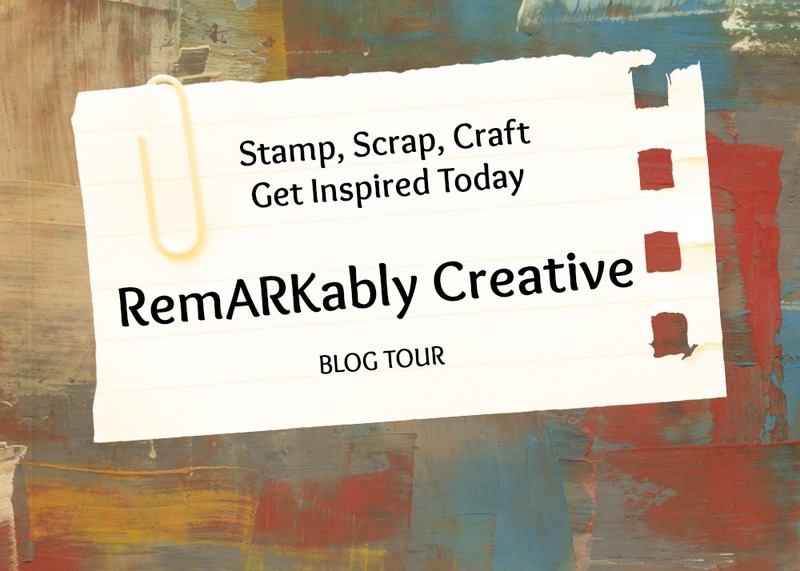 RemARKably Created Blog Hop: Bundled Up! Out theme for this month is BUNDLED UP! That means each blog you visit during this hop will feature one or more of the bundles available in the new 2018 Occasions Catalog. If you haven’t received your copy of this catalog yet, what are you waiting for? Just email me and I will get one sent out to you! So, my project features the FRUIT BASKET BUNDLE (145977). 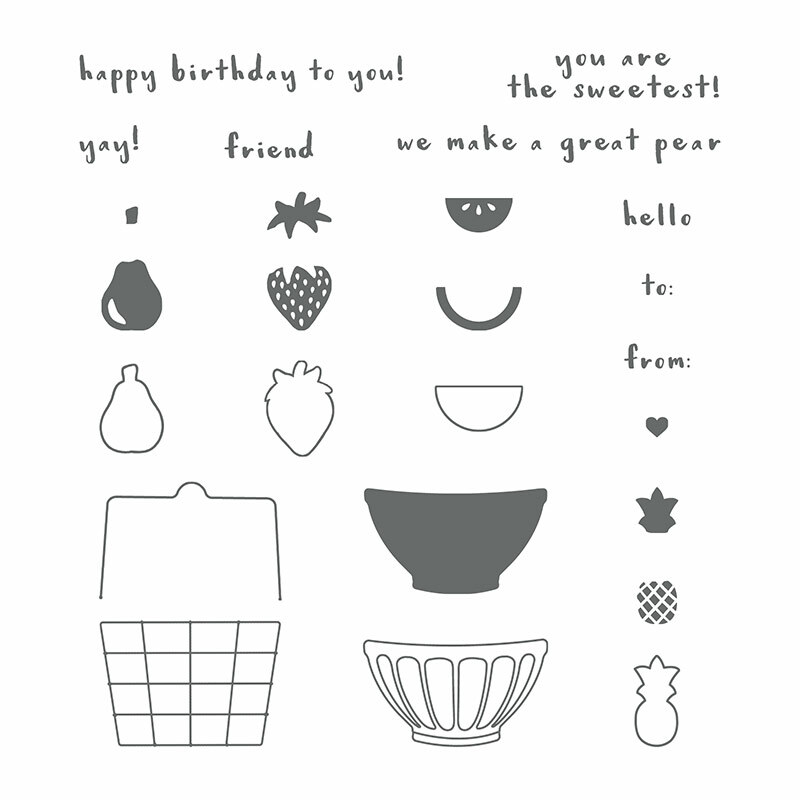 This bundle includes the Fruit Basket Photopolymer Stamp Set (145833) and the adorable Itty Bitty Fruit Punch Pack (145657). 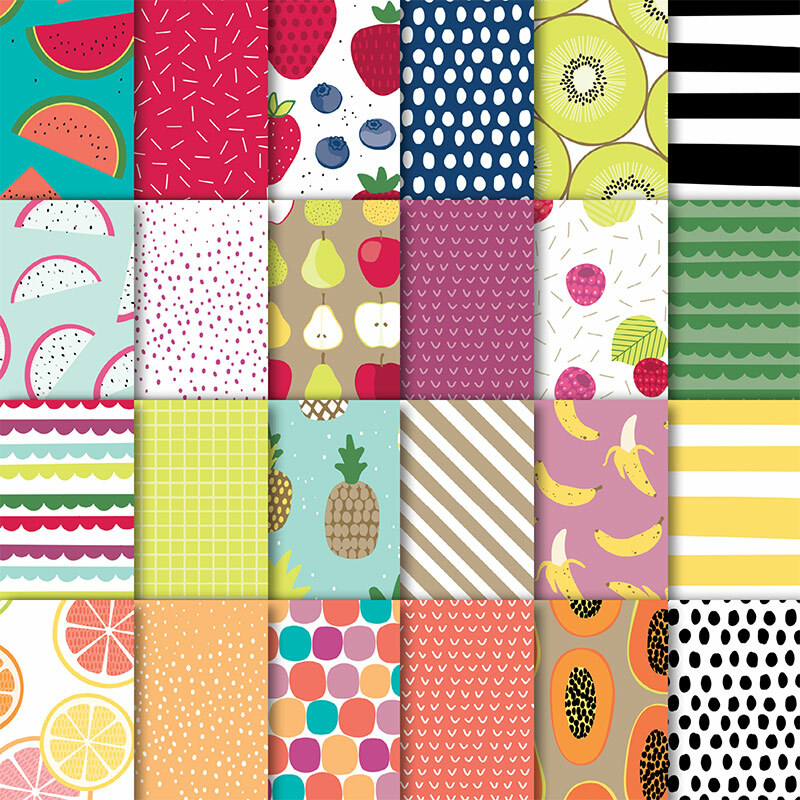 It’s part of the Tutti Frutti product suite found on pages 28-29. Is that not just the cutest! So, are you asking yourself where I got that card and envelope from? It’s from the new 2018 SALE-A-BRATION catalog. 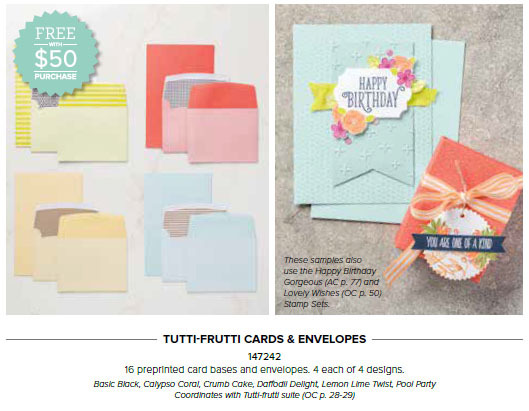 This tiny catalog is full of all sorts of FREE stuff you can earn with every $50 or $100 purchase… So, by adding the Lemon Lime Finely Woven Ribbon to the bundle and the DSP, you have a $50 order in the US and can get the card/envelopes for FREE! Dontcha just need them? They are perfect to go with this suite.. but they can do more. Come back in a couple hours and check out another card I made with using the Daffodil Delight card. Until then, here is a close up on the fruit basket! 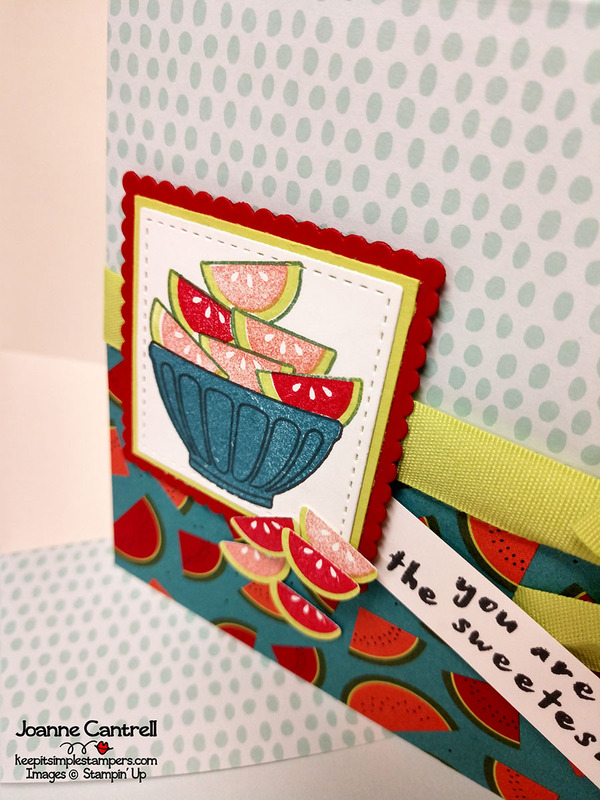 Those little watermelon slices were so easy to make – the stamp set comes with the three stamps: the outline, the rind, and the center. I probably could have used a Basic Black Stampin’ Write Marker to color in the seeds.. but whose got the time for that!?! So, I stamped a couple extra slices and punched them out with the little punch. And. 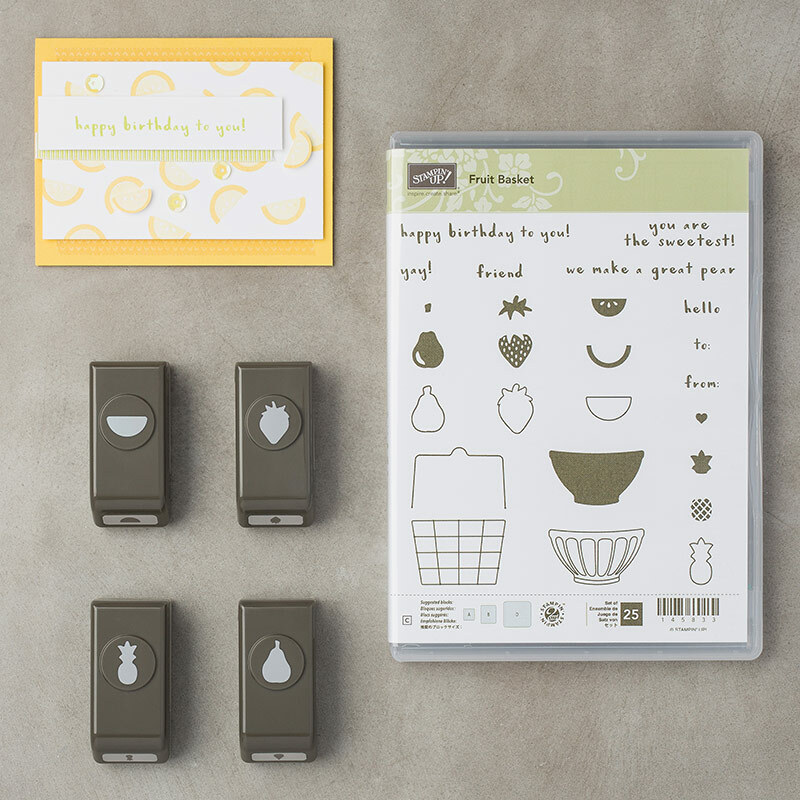 I’ll give you a tip – these punches are meant for the stamps, so they cut really close and don’t leave a border – therefore, I would not have needed to stamp the outline because it was just cut off! So, save a step!!! Now, just because I am in a very giving mood today, the complete supply list can be found at the bottom of this post Oh what the heck… here is a project sheet too! 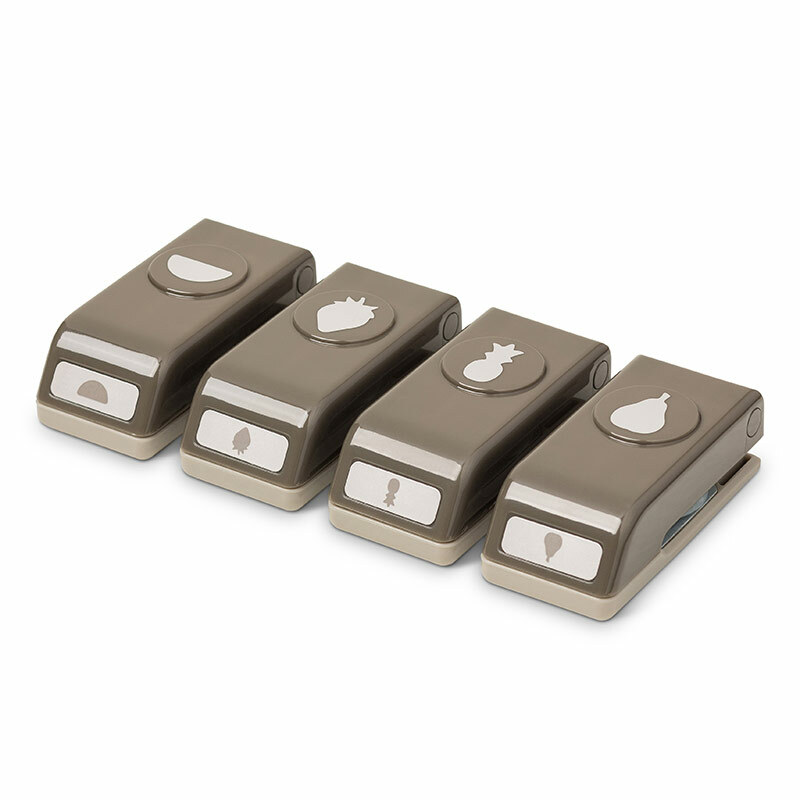 Well, that’s it from me for now… check back in a couple hours for another project with the Stamper’s Dozen Blog Hop! Here’s the list of blogs… Get hoppin’! Next > Stamper’s Dozen Blog Hop – Let’s Sale-A-Brate! Sooo cute! Thanks for sharing your tips on the punches too! Love your projects, very cute and ‘sweet’. Thanks for the ideas on how to use it. 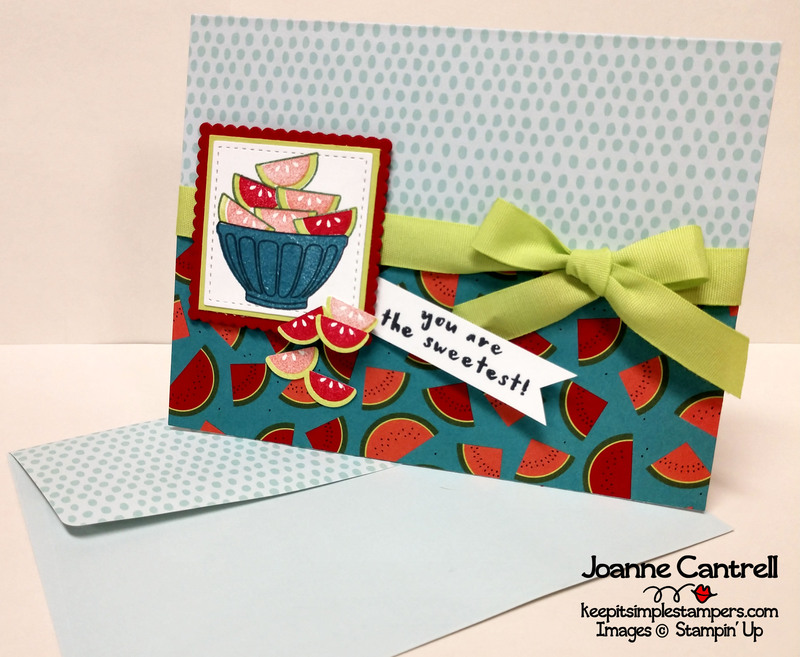 Love your watermelon slices on both cards. So cute! Your card is so cute, Joanne! I love it!